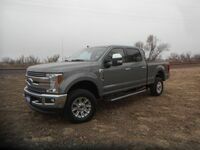 Workhorse performance is a standard feature on the 2018 Ford F-250 Super Duty in Ogallala NE. This impressive heavy duty pickup truck is ready for any challenge. The 2018 Super Duty supplements this workhorse performance with an extensive list of comfort, safety and technology features. Three cab options and two bed lengths will be offered on the 2018 Ford Super Duty. The truck can be configured with regular, SuperCab and SuperCrew cab options. 6.8-foot and 8.2-foot bed options are available. Two engine options are offered on the 2018 Ford Super Duty. Standard equipment includes a 6.2-liter gasoline V-8 engine. This engine delivers 385 horsepower and 430 pound-feet of torque. The Super Duty also offers a turbocharged 6.7-liter turbodiesel V-8 engine. The diesel engine increases the performance numbers offered on the truck to 450 horsepower and 935 pound-feet of torque. Either engine option is paired with a six-speed automatic transmission. 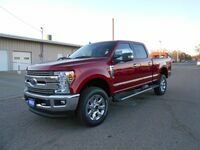 When properly equipped, the 2018 Ford Super Duty offers a maximum conventional towing rating of 21,000 pounds, a 5th-wheel towing rating of up to 27,500 pounds and a gooseneck towing rating of 34,000 pounds. 2018 Ford F-250 Super Duty models will be offered in XL, XLT, Lariat, King Ranch, Platinum and Limited trim levels. Each trim level offers a different collection of comfort, safety and technology features. 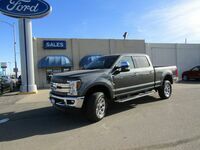 Comfort and Technology Features: Rear under-seat lockable storage, USB, Bluetooth and auxiliary connectivity, SYNC 3 touchscreen infotainment system, satellite radio, dual-zone automatic climate control, Sony audio system, leather upholstery, heated and ventilated seats. Safety and Driver Assistance Features: Blind spot monitoring with rear cross-traffic alert, surround-view camera system, adaptive cruise control, collision warning with brake support, Ultimate Trailer Tow Camera System. Exterior Features: Power side mirrors, automatic wipers, LED box lighting, LED headlights, tailgate step, remote tailgate release, panoramic sunroof, spray-in bedliner, skid plates.